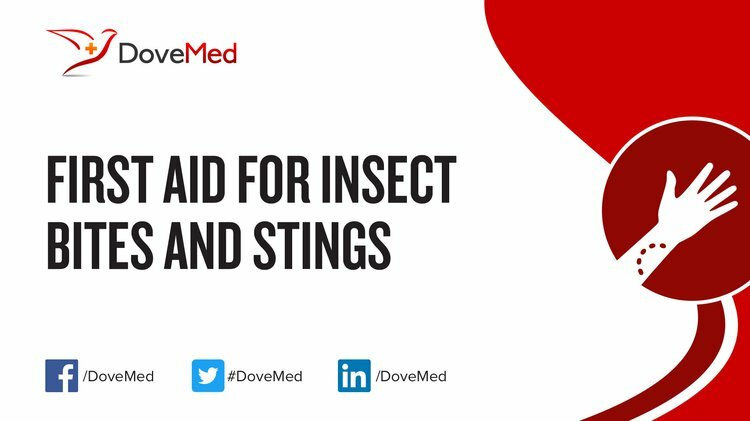 Insect Bites and Stings are wounds or allergic reactions caused on contact with insects. What is Insect Bites and Stings? What are the Causes of Insect Bites and Stings? Insect Bites and Stings occur following exposure to insects, such as bees, ants, wasps, ticks, and many other insects. What are the Signs and Symptoms of Insect Bites and Stings? The severity of the symptoms depends on the type and number of insect involved. How is First Aid administered for Insect Bites and Stings? Who should administer First Aid for Insect Bites and Stings? What is the Prognosis of Insect Bites and Stings? How can Insect Bites and Stings be Prevented? Warrell, D. A. (2012). Venomous bites, stings, and poisoning. Infectious disease clinics of North America, 26(2), 207-223. Warrell, D. A. (2010). Snake bite. The Lancet, 375(9708), 77-88. Li, F., Jiang, F., Jin, X., Qiu, Y., & Shen, X. (2012). Pediatric first aid knowledge and attitudes among staff in the preschools of Shanghai, China. BMC pediatrics, 12(1), 121. Jesslin, J., Adepu, R., & Churi, S. (2010). Assessment of prevalence and mortality incidences due to poisoning in a South Indian tertiary care teaching hospital. Indian journal of pharmaceutical sciences, 72(5), 587. Ranse, J., & Hutton, A. (2012). Minimum data set for mass-gathering health research and evaluation: a discussion paper. Prehospital and disaster medicine, 27(6), 543-550. Cournoyer, M. E., Garcia, V. E., Gallegos, U. F., & Wilburn, D. W. (2011). Investigation of injury/illness data at a nuclear facility. Journal of Chemical Health and Safety, 18(5), 17-25.